I realized the other day just how many weird and random thoughts I have related to running. Rather than being embarrassed, naturally I started filing these away for a post. 🙂 Yes, these quirks probably mean I’m officially a weirdo, but I figure there must be some other crazies out there too. 2. Going to bed the night before a race makes me feel 100% like a kid on Christmas Eve. It’s ok, brush it off. No one saw that. 5. When I’m shopping, I am physically drawn towards the athletic apparel. I MUST look at it, even if I don’t *need* anything. And if something is on sale…?! 6. I get really excited when I see other cars with 26.2 or 13.1 stickers on them. This entry was posted in Funny, Musings and tagged Half Marathon, Running, Thoughts of a Runner, You Know You're a Runner When. Bookmark the permalink. Oh I love his list! 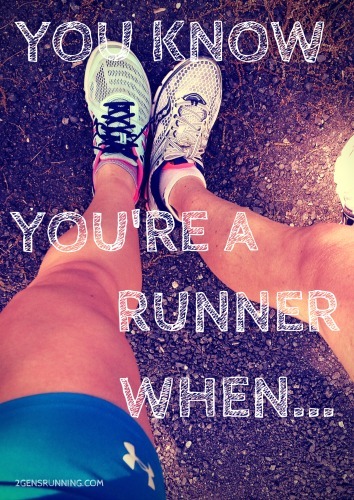 I would definitely add the sheer excitement for your run when wearing your favorite running outfit. AHH That’s such a good one! I can’t believe I forgot that! I definitely do numbers 3, 4, 5, and 8 too 🙂 When I have an especially crappy commute, I like to think about how I could have run it faster (my commute is just shy of a half marathon in distance, and faster runners could definitely run it faster than it usually takes me! ), even though that can be a depressing thought sometimes. Must have all the running clothes I can get!!! YES! Haha. And I love seeing other cars with the stickers on them even though I don’t have any of my own (my bf would prob disown me if I become one of THOSE people even though I have no problem with it lol). Haha, I haven’t plastered my bumper with running stickers (yet). And the traffic one seems to be pretty popular! HAHAH I totally do #4, 7, and 8! 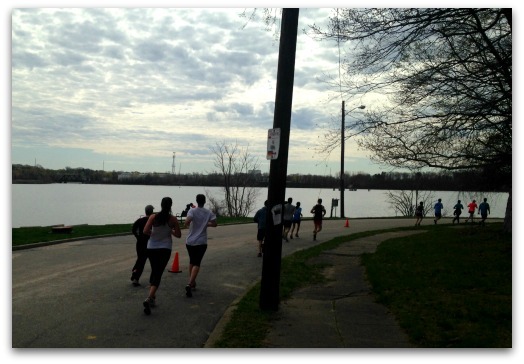 I feel jealous when I see people out enjoying a run – even if I have only had my own run earlier that day! Haha yes to #3 and #8! I’m still learning about all the best places to run here and the best races to sign up for in Anchorage.